“Two Americans, Asher Warner and Charles Terry were mortally wounded and several others were struck in the initial volley. The next morning the Bitish opened a slight cannonade, landed a small force, seized the few stores in the warehouses and then set all the buildings but one on fire. The building saved was a recently erected tavern called the Mansion House. This building was spared because Asher Warner, severely wounded in the first volley, had been picked up by the British and carried into the tavern where he died hours later. It is said that the man locked in the Lummis mill (Isaac Davidson) , found the dead man in the tavern, the pitcher of water (left by the British) still clutched in his hand. The story of the return of Asher Warner’s remains to his home is a pathetic one. The Warner family – Asher, Mrs. Warner, and two boys (children of Mr. Warner by a former wife) – lived about one-half mile north of the Brick Church (near Wallington). Word reached the family that Mr. Warner had been killed. Twelve year old Daniel harnessed a horse to the lumber wagon and drove his lonely way through the many miles of woods to Sodus point, reaching there between sundown and dark. Isaac Davidson and another man helped take his father’s blood-soaked body from the tavern and place it in the wagon. In utter darkness and with his gruesome burden, the boy wended his way back, counting every hoof beat that brought him nearer home. But he arrived to find the log house dark and deserted. His stepmother, displaying shameful callousness, had taken five-year old Jonathan with her and departed for a neighbor’s house two or three miles away. Daniel had to go nearly a mile for help. He got John Peeler, a boy about his own age, and the two children alone and at midnight carried the body from the wagon into the house, keeping watch over it until nine or ten o’clock the next morning when neighbors came and prepared the remains for burial. 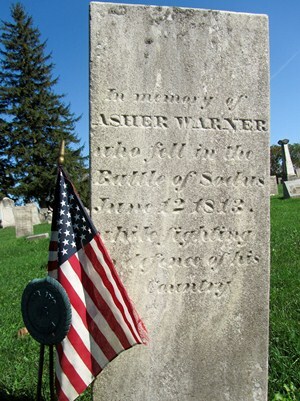 Asher Warner is buried in Brick Church cemetery, his grave marked by a monument erected years later by the younger son, Jonathan. While the date of death on the tombstone is given as June 12, 1813, and this date is sometimes given in newspaper accounts of the period, affidavits filed in attempts to get compensation, and other credible evidence, establish the 19th as the correct date. 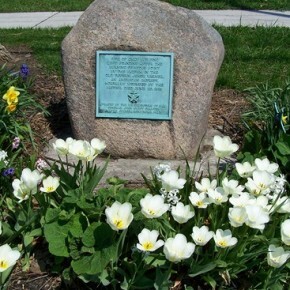 In 1927, the General Swift Chapter, Daughters of 1812, placed two boulders with bronze plaques at Sodus Point, one at the site of the engagement, and the other at the site of the Mansion House where Mr. Warner died. U.S. Congressman. Graduating from Williams College, Massachusetts, in 1808, he was a professor in a college South Carolina, in 1810, studied law, was admitted to the bar and practiced law in Sodus, New York. During the War of 1812, he served in the military and fought in the Battle of Sodus Point. After the war, he was a member of the New York State Assembly, (1816-22) and served in the New York State Senate, (1823-24) in 1843, he was elected as a Democrat to the Twenty-eighth Congress, serving until 1845. After leaving Congress, he lived in retirement until his death at age 79.
by Lewis H. Clark, 1883. These 63 names were all mentioned in this book by Lewis H. Clark. It is said that Gilbert Saulter was a “colored man”. He and Harry Skinner and Christopher Britton were taken prisoners and released the next morning. It is difficult to know for sure who was there that night. Was Isaac Davis as mentioned here really Isaac Davidson, as mentioned in the Military History of Wayne County, NY book by Lewis H. Clark ? For the benefit of the doubt , I have noted all the names found in the two books. are also documented as participating that night in the battle. Job Allen was a Private in the 1st (Royal Scots) Regiment of Foot – 1st Battalion. He was from Fain County in Scotland. Before becoming a soldier he was a carpenter. He died from his wounds almost immediately. John Whammond was also a Private in the 1st (Royal Scots) Regiment of Foot – 1st Battalion. He was from Forfair County in Scotland. Before becoming a soldier he was a weaver. He died from his wounds the following day after the battle.